Around 15 million people are expected to be employed in the automobile industry directly by 2022, according to a report by the National Skill Development Corporation (NSDC). India’s automobile sector directly and indirectly provides jobs to around 19.1 million people now. 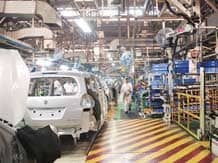 The report said Brazil, Russia, India and China (BRIC) nations would be key growth drivers for the global automotive industry because of cheap labour and a favourable investment environment. More companies were looking at India as a manufacturing base and were shifting operations from Europe to India and other south-east Asian countries, it added. Changing technology, larger disposable incomes and lower first-hand life cycles of cars had triggered the need for fresh skilling in the sector, the report said. Of the 7.6 million people employed in manufacturing in the country, 72 per cent work in the automobile component industry. Over 70 per cent of automobile component companies are small and medium enterprises. Addition of one job at an original equipment manufacturer generates eight jobs with vendors. Dilip Chenoy, managing director and chief executive officer of the NSDC said the automobile industry accounted for 22-25 per cent of the country’s gross domestic product in manufacturing. “To meet the incremental human resource requirement in the sector the ecosystem has been scaling up training initiatives and aligning themselves to industry- recognised national occupational standards,” Chenoy said. “There is an urgent need to update courses with changes in technology implemented at the plants. We need to emphasise the promotion of small and medium enterprises as they have an immense potential to provide jobs at the entry level,” he added.